What is Algebra for Applications? 1 How is the course organized? Course Overview: Often the Algebra we learn is devoid of context. We will look at Algebra through the lens of how we apply it in the real world. We will explore pure elementary algebra in the context of its practice. At the end of this course students should have an inventory of problem solving strategies. This course covers and goes beyond standards from the Common Core Integrated Math pathway. This course is primarily intended for students curious about for what they are ever going to use high school Algebra. The course is intended for both students whose strengths and interests are in STEM fields or students whose strengths are in verbal reasoning. 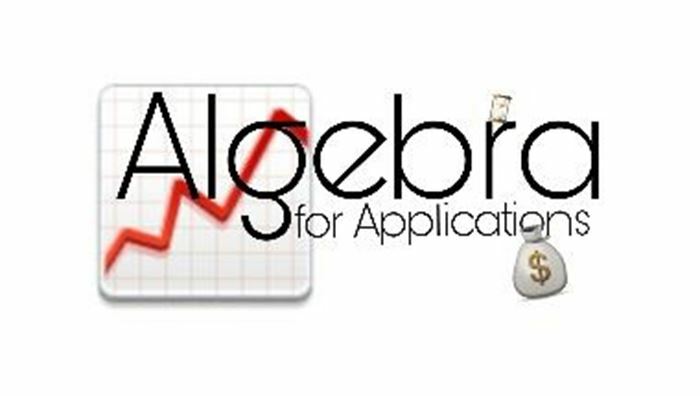 Any student looking for relevance in many of the topics of a traditional Algebra 1 course should take Algebra for Applications and Problem Solving. Solve real world problems involving rates, ratios, and proportions - food, money, travel, etc. To determine if a solving for parameter of a formula produces a function of another parameter. I care about my students' education. I believe that learning should make your brain hurt. I believe that all students can learn. I believe that a quality mathematics education is enriching for all students.